Today’s Flash Back Friday comes from Episode 199, originally published in January 2014. Not everyone finds aluminum as fascinating as Dr. Christopher Exley, who happens to be one of the world’s leading experts on the topic. Some how, some way, the good doctor’s infectious enthusiasm is impossible to deny. Listen in on this episode of The Holistic Survival Show as host Jason Hartman interviews Dr. Exley about an intriguing paradox; how is it that the third most abundant element in the Earth’s crust is non-essential and largely harmful to life? His research over the last three decades has led him to investigate the silicon (the second most abundant element in the Earth’s crust) connection to aluminum, or more specifically, is it silicon’s primary duty to to keep aluminum from wreaking havoc with biology? 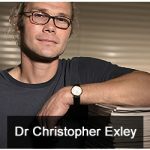 Exley is currently the Reader in Bioinorganic chemistry at The Birchall Centre, Keel University in Staffordshire and Honorary Professor at the UHI Millennium Institute. He is a biologist (University of Stirling) with a PhD in the ecotoxicology of aluminum. Strangely, this toxic element can be found in medicines, vaccines, deodorant, sunscreen, antacids, and more. The good news is that it can be easily leached from the body – with silicon rich mineral water – which Exley believes is like a natural antidote.